"Speculative knowledge alone, without devotional service, is not able to give liberation. On the other hand, even without knowldege one can obtain liberation if one engages in the Lord's devotional service." Sri Chaitanya Caritamrita, Madhya Lila, 22.21. Bhagavad Gita 5.22, Srila Prabhupada. T he idea for this book first emerged in 1973, when Srila Prabhupada began asking his secretary, Syamasundara dasa adhikari (Sam Speerstra), about Western philosophy. Syamasundara would try to state succinctly the major ideas of certain philosophers, and Prabhupada would give the Vedic view. As Prabhupada traveled throughout the world preaching Krsna consciousness, this process continued, until finally, in 1976, Prabhupada's editor, Hayagriva dasa adhikari (Professor Howard Wheeler), supplied further questions for Prabhupada and completed the editing. 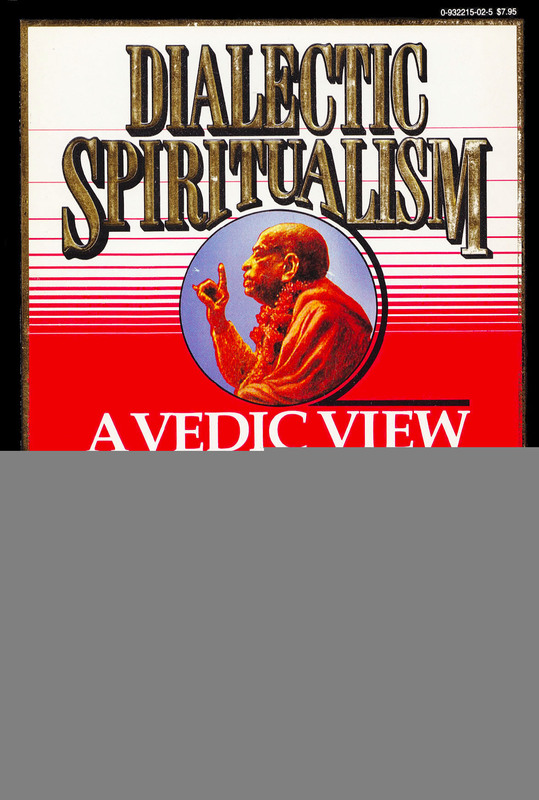 Then Srila Prabhupada gave the book its title: Dialectic Spiritualism: A Vedic View of Western Philosophy, and said, "Print it." Almost immediately some people objected that since professional scholars had not presented the material to Srila Prabhupada, there might be some discrepancies. When the manuscript was shown to a philosophy professor, he called it "a treatise against philosophy," and "an unscholarly punch in the nose." Then, when Srila Prabhupada left this mortal world in November, 1977, the book's future became uncertain. One student tried to restate the questions. Then another tried, only to conclude that it would be better to start all over. But Srila Prabhupada was no longer present, and the extensive work, on which he had spent so much time, remained unavailable to the world. Finally, in 1984, Hayagriva resolved to print Srila Prabhupada's last great opus as it is, and for this we are all greatly indebted. Whatever the criticisms, they are rendered insignificant in the light of Srila Prabhupada's brilliant insights into the problems of Western philosophy and his lucid expositories of the Vedic view. Much of the confusion arises from a difference in methodology and perspective. For many Westerners, philosophy is a kind of armchair speculation, an intellectual game, but for the follower of the Vedas, it is a matter of life and death. Or, more precisely, it is the recognition of the absolute need to stop the repetition of birth and death.